A "pescatarian" or "pesco-vegetarian" diet is essentially a vegetarian diet that also includes fish as an additional protein source. A pescatarian diet packs many of the benefits of a plant-based diet, including leaner body composition, lower risk of heart disease and reduced inflammation, while offering you great flexibility in your choice of proteins. But it also comes with a few drawbacks. Although a pescatarian diet is generally considered very healthful, its potential disadvantages include mercury exposure, along with ethical questions about fish farming and wild harvesting practices, such as overfishing, antibiotics use and bycatch. First, the benefits: Although clinical research on the pescatarian diet alone isn't very extensive, this diet is very similar to the Mediterranean diet, which has been well-researched and found to increase your life expectancy while also reducing your risk of several chronic ailments including heart disease and Type 2 diabetes, along with breast cancer. A pescatarian diet also helps to round out many of the nutritional deficiencies that can be present in a typical vegetarian diet, because fatty seafood contains vitamin D and beneficial omega-3 fatty acids, while fish eaten whole (such as anchovies) can be a beneficial source of calcium. Seafood also contains vitamin B12, which can be lacking in many vegetarian diets. 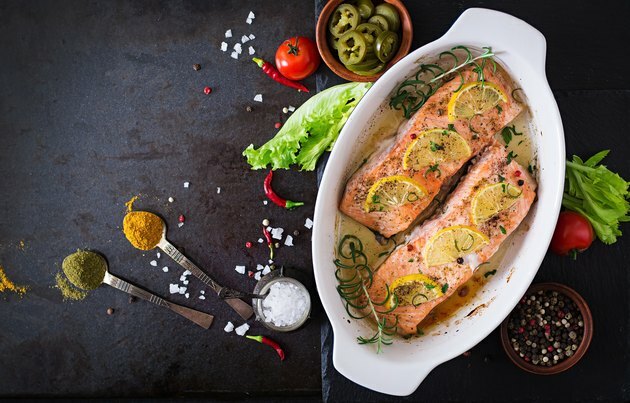 Fish and seafood options can be surprisingly rich in iron, too — another nutrient that vegetarians sometimes find themselves lacking, mainly because plant-based foods contain non-heme iron, which the body doesn't absorb as readily as the heme iron from animal sources. For example, in an article for the trade magazine Today's Dietician, Janis Jibrin, author of The Pescetarian Plan, notes that 4 ounces of mussels contain almost half the recommended daily intake of iron. One of the biggest disadvantages of a pescatarian diet is that some types of fish can be high in mercury, a neurotoxin that can cause a wide range of bad health effects, including muscle weakness, loss of peripheral vision, impaired fine motor skills, tremors, headaches, insomnia and emotional changes. The good news is that smaller fish tend to have much less mercury content than larger fish, so they're safer to eat. Least Mercury (eat at will): anchovies, herring, North Atlantic mackerel, pollock, sardines, shrimp, freshwater trout, squid, clams, crayfish and catfish. Moderate Mercury (eat six or fewer servings per month): carp, cod, bass, mahi mahi, lobster, snapper, freshwater perch, and skipjack or canned chunk light tuna. High Mercury (three servings or less per month): halibut, ocean perch, Chilean sea bass, albacore or yellowfin tuna, and Spanish mackerel. Highest Mercury (avoid eating these fish): bluefish, grouper, king mackerel, marlin, swordfish, bigeye and ahi tuna, shark and orange roughy. In some circles. there is a misconception that farmed fish may be free of mercury, but, of course, these fish can still absorb mercury that has settled in the water, just as wild fish can. Farmed fish can still be exposed to PCBs and dioxins — other common, waterborne pollutants — as well. Vegetarians are often painted with a sort of righteous, luminous glow — if you eat all those vegetables, shouldn't you be among the healthiest people on the planet? And a pescatarian diet is essentially just a vegetarian diet, plus fish. But the truth is that it's not hard to eat an _un_healthy vegetarian diet by focusing on less-healthy foods like pasta, white rice, processed bread, fruit juice and soda. But don't worry: It's actually pretty simple to switch your pescatarian or vegetarian eating habits to a healthy version. Focus on consuming a wide variety of colorful vegetables; the more, the better. Aim for variety of color and type in your fruit consumption too, along with a fairly even split between whole grains and healthy proteins, plus a dash of healthy cooking oils like olive oil and canola oil. One of many reasons people may choose to go vegetarian or vegan is because they don't approve of eating animals. Obviously if you opt for a pescatarian diet, you're still eating animals: fish. But if you stick to wild-caught fish, you can feel good about not supporting factory farming in any fashion. However, there's always a catch — and in this case, it's that not all fish farms are ethically run. In fact, it's common for fish to be kept in underwater pens so crowded that they must be repeatedly dosed with antibiotics to prevent disease and pests from taking hold. Farmed fish can also absorb, and pass on, herbicides and pesticides from the land-vegetable-based diet they're often fed. Wild-caught fish are not without their complications; overfishing and bycatch (the accidental harvest of other species) are both serious problems in some fisheries. If you're not sure how to start tracking down sustainable and ethical fisheries in your area, the Monterey Bay Aquarium Seafood Watch program offers downloadable consumer guides for all 50 states. Read more: Which Is Better: Wild-Caught or Farmed Fish? If you spend much time at the seafood counter in grocery stores or farmer's markets, you already know that some types of seafood can get pretty pricey. But you don't need to eat lobster every day on a pescatarian diet (and in fact you shouldn't, because of its mercury content). Instead, stretch your dining dollars by shopping for fish that are relatively inexpensive, like catfish, mackerel and sardines. As a bonus, these fish are also relatively low in mercury content. Also, just because you can eat fish doesn't mean it has to be your only protein source. A healthy pescatarian diet can also include plenty of budget-friendly, plant-based protein options such as beans, soy and tempeh. Harvard Health Publishing: What Is a Plant-Based Diet and Why Should You Try It?